Notes: There are no signs but the castle is relatively easy to find with the tree covered motte clearly visible from the waterfront. There is a large pay and display car park adjacent to the castle. Little remains of the castle other than a motte, which is now covered in trees and has been deformed by landscaping, along with trace ditches. 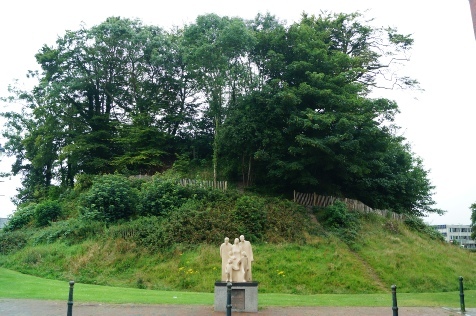 The top of the mound can be accessed although the foliage limits the view. River Taw. Today the trees and urban development mask the castle - but as is clear from the above photograph the structure originally dominated the river. Barnstable Long Bridge. The bridge was first built in the thirteenth century, at which time the castle was still in use, but later extensively modified in 1796 and 1963. The first recorded reference to Barnstable Castle dates from the twelfth century but the fortification was probably raised in the immediate wake of William I’s military campaign in the South West in 1067. The castle remained in use for 200 years but the defences were demolished by Henry III in the first half of the thirteenth century. At the time of the Norman invasion, Barnstable was already an existing Anglo-Saxon settlement. It is not entirely clear when the castle was first raised - the earliest recorded reference dates from the twelfth century - but it seems probable it was constructed in the years immediately following the Conquest. Certainly William I came to the area in strength in late 1067 in order to quell an uprising centred on Exeter and extending throughout the South West. Thereafter the territory was granted to Juhel (later known as Juhel of Totnes) and it was perhaps he who built Barnstable Castle. Part of the existing settlement was cleared to make way for the new structure and its bailey was built on top of a former Anglo-Saxon cemetery; all evidence that the castle was intended to subjugate the populace. A traditional motte-and-bailey fortification, Barnstable Castle was a substantial structure. The mound stood at 14 metres tall and was topped with a timber palisade which created a shell keep and enclosed a tower, hall and kitchen. The bailey itself also had substantial defences with an earth rampart almost 10 metres thick and was almost certainly topped with a timber palisade. Both motte and bailey were surrounded by a ditch which was later flooded from the river to create a moat. The substantial defences highlight the strategic importance of Barnstable. 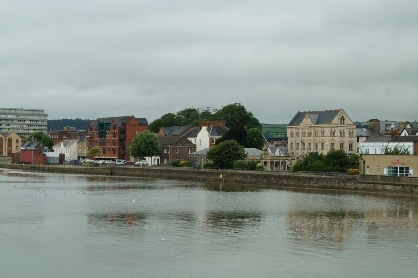 Situated at a fording point over the River Taw, and near its confluence with the River Yeo, the site controlled key communications arteries into Devon. Furthermore both rivers were navigable in immediate vicinity of the castle providing access to the Bristol Channel. At the time of the Anarchy (1139-53), the civil war between King Stephen and Matilda over the right of succession to the English throne, Barnstable was held by Henry de Tracy. He was a strong supporter of King Stephen but, in Devon, he was in the minority. The leading magnate in the region was Robert, Earl of Gloucester - Matilda's half-brother and her chief military adviser. The other key landowners in the area at the start of Stephen's reign were Robert of Bampton (Bampton Castle), Alfred son of Juhel (Totnes Castle), Henry de Pomeroy (Berry Pomeroy), William son of Odo (Torrington Castle), Baldwin de Redvers (Plympton Castle) and Guy de Nonant. None were particularly well disposed to Stephen. There was no recorded action at Barnstable Castle at this time with some accounts suggesting the castle, due to the poor support for the King elsewhere in Devon, was abandoned at the time. Either during or shortly after the Anarchy, the castle was rebuilt in stone. The motte was probably expanded at this time and a circular, stone curtain wall replaced the wooden palisade around the summit of the mound. An enclosed Keep, known as a Donjon, was built within the shell Keep. The castle ceased to be a defensive site in 1228 when Henry III instructed the Sheriff of Devon to reduce the defences on the grounds it was an unlicensed fortification. The then owner - Henry de Tracey - was allowed to retain walls 10 feet (3 metres) high to enclose his house and other buildings within the castle's perimeter. Torrington Castle, also owned by Henry de Tracey, was completely demolished at this time. The reduced status of the castle led to it falling into disrepair and by the early fourteenth century it was described as ruinous. Stone was robbed for local use and the entire site went out of use. The last standing fragments collapsed during a storm in 1601. The castle area was landscaped in the early nineteenth century concurrent with the construction of a mansion known as Castle House. The trees were planted on the motte at this time and the spiral path was cut into its structure. Castle House was demolished in 1976.